Kerala, the land of my birth, is very similar to Lanka in its topography, climate, fauna flora and even the cultural and ethnic qualities of its peoples. The phonetics of the Malayalam language is more similar to the spoken Tamil of Jaffna than that of South India; yet, the morphology of the Malayalam alphabets is more similar to those of the Sinhala language than the Tamil. The industrious and adventurous nature with their thirst for education make Keralians more similar to the people of the North than those of the South in this country. But, in their social and domestic habits Keralians are more similar to the Sinhalese than the Tamils. Like Ceylon, the chief products of Kerala are tea, rubber, coconut, paddy and spices. Kerala, like Ceylon, has a coconut-growing wet zone where the Malayalees live, and a palmyra-growing dry zone where the Tamils live. After India attained independence the palmyra country was merged with the Tamil Nadu. The present Kerala is the Malayalam-speaking coconut country formed by the merger of Malabar, Travancore and Cochin. The meaning of the word Kerala itself is the 'land of coconut’. The three main religious communities of Kerala arc the Hindus, the Syrian Christians, and the Moplah Muslims. They live happily as good neighbours, sharing many social customs in common. As in Ceylon, witchcraft and devil dances thrive even to this day among the villagers in Kerala. More than half a century ago, when I was a young boy, it was a common practice to resort to witchcraft whenever anything untoward happened in the family. Most householders, as a result of superstitious beliefs, treasured some sort of' sacred' medicine or talisman which, they imagined, could affect magical cures for all their ailments. For the Nairs it was the 'sacred' water - theertham - from the holy river Ganges, brought by pilgrims who returned from the' sacred' city of Ben ares. For the Syrian Christians it was often the sanctified oil from Antioch or tile 'sacred' water from Lourdes. For the Moplahs it was the water sanctified by the container made to touch the 'sacred' Kaaba stone at Mecca brought yearly by the Haji pilgrims. From 1921 to 24 my younger brother the late Dr. Behanan T. Kovoor of the Yale University, U. S., and I were students at the University of Calcutta. The city of Calcutta is about 1500 miles from my native town Tiruvalla. It took about five days for us to reach Calcutta by train. A trip from Tiruvalla to the distant city on the banks of the river Ganges, by two young boys in search of higher education was an unusual event those days along the people of our neighbourhood. Because of the long distance and the heavy expense involved, we used to come home only once a year during the long mid-summer vacation. Our departure to Calcutta after the holidays was a ceremonial affair. Days be­fore our departure, both my brother and I were feted by our neighbours. During the last few days of our holidays we had practically all our meals in the neighbouring houses irrespective of caste, creed or class. Almost all the Nair families wanted us to bring for them, when we returned at least a few drops of' theertham' (Ganges water). For them, we were extremely fortunate because even in our boyhood we would be getting a chance of bathing in the 'sacred' waters of the 'holy' Ganges, and thus attain 'moksha' without much effort. 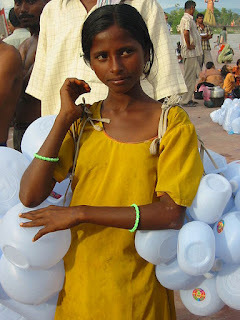 for carrying Ganges water, Haridwar. On the day of departure, our house and courtyard used to get crowded with men, women and children from the neighbouring houses. The men folks in our neighbourhood, who were mostly farmers and petty land-owners, kept away from their normal work that day for the sake of bidding us farewell. After prayers and blessings by our family priest the Rev. K.P. Thomas, a beloved cousin of mine, our mother insisted that we went round to all the elderly men and women in the group to receive their blessings, which they did by placing their hands on our foreheads, with tears rolling down their cheeks. Many women used to burst out into loud weeping. The sympathetic effect of their weeping on our tender minds made us also shed tears. It was really a touching separation, the effect of which used to linger in our minds throughout the whole journey. Fortunately, on reaching Calcutta, the multifarious attractions of the big city, and the boisterous life in our hostel made us forget fast all about the home and our good neighbours. Such thoughts came back to our minds only when the time for our return trip approached during the next summer. The river Ganges which has its source in the 'sacred' Kailas (Himalayas) flows down the Gangetic plain for about 1500 miles and falls into the Bay of Bengal. Calcutta is at the mouth of this river. It is in flood throughout the summer months when the snow on the Himalayas melts. Since it is a fast-flowing river, its water is always muddy. During my long stay in Bengal I bathed in this river only once. It became my first and last bathe in that river because of a shocking experience I had on that occa­sion. As I lifted my head out of the water after a long immersion my head came in contact with a white and slimy object. It turned out to be a highly decomposed dis­membered human hand, partially eaten away by fish. It made me sick, and I had to go without food for a couple of days. Though prohibited by law at present, during the days of my youth it was the usual practice among the Hindus of North India to ceremoniously deposit the dead bodies of their dear ones into the 'sacred' waters of this holy river. By this they insured 'moksha' for their departed souls. 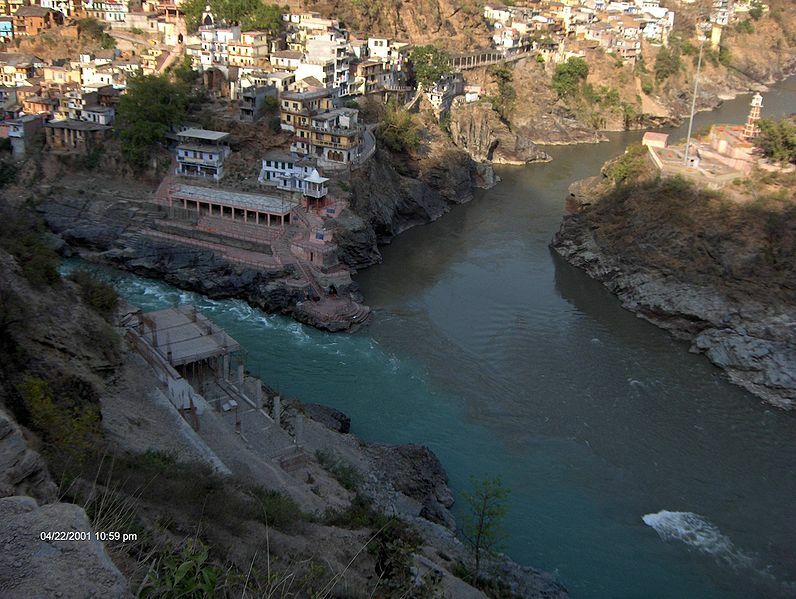 Those who lived far away from this river had to be satisfied by throwing the ashes into it after cremation. More than half a century ago one could see at any time numerous floating carcasses flowing down this river in various stages of decomposition. 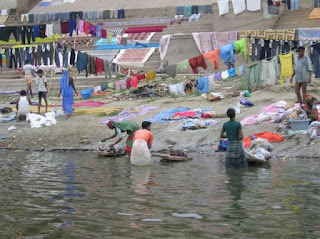 Thousands of dead bodies were dumped into this so-called sacred river every day at hundreds of cities, towns and villages along the banks of this long river. Yet, millions of pilgrims from allover India 'purify' themselves by not only bathing in it, but also by drinking the polluted water. I have seen devotees pushing away carcasses which come their way, and continue their ablu­tions. They were brainwashed from childhood into the belief that in spite of the pres­ence of decomposing carcasses in it, the water of the Ganges is pure and 'sacred'. As a result of the abhorrence after my first nauseous experience in this 'holy' river, I decided not to take even a drop of water from it to my good neighbours. Since Behanan and I were reluctant to disappoint them, we decided to substitute some good well water for the Ganges water. The nearest Railway Station to Tiruvalla those days was Kottarakkara. When we got down from the train at Kottarakkara we used to fill two bottles with drinking water from the filter in the waiting room, cork them properly and keep them along with our luggage. From that time onwards the water in the two bottles was called 'theertham' . To reach Tiruvalla we had to travel about 56 miles by transport bus. There were many buses running on this route, all belonging to different operators. There was much rivalry and competition among those bus operators. This competition was a boon for the passengers as they received very polite and liberal treatments from them. As there was no governmental control over bus transport those days, buses came and went at unscheduled times, took whichever routes the driver liked, stopped whenever the passengers wanted, and cancelled trips according to the whims and fancies of the operators. To make sure of their fare the conductors and cleaners of the few buses at the Kottarakkara Railway Station used to struggle among themselves to put the luggage of the waiting passengers on the hood of their own buses. Once the luggage was on the top of their bus, they were sure that the owner of the luggage would get into their bus. When the conductors and cleaners handle our luggage roughly in their struggle to secure their fare, we used to 'beg them to be extra careful about the handling of the two bottles of 'theertham'. The word 'theertham' had an electrifying effect on them as well as the other fellow passengers. They handled the two bottles with due respect, and saw that both of us were given specially reserved seats by the side of the driver. Finally, on reaching Tiruvalla, the bus is diverted from the normal route with the sardine-packed passengers in it, and driven to an extra distance of about two miles to drop us at Kovoor house. After dropping our luggage and us at home the conductor produced a small phial with the humble request for a small quantity of the theertham to be shared among the driver, the cleaner, and himself. We used to entrust the two bottles of theertham to our devoted Christian mother. With pride and pleasure she used to distribute the theertham to our Nair neighbours according to their needs. Till the death of our beloved mother in 1942 she was not told the real truth about the theertham. During the first two days of our arrival home, our neighbours used to flow in to greet us and to get their share of the sacred water. Next mid-summer too the same fraud was repeated with all solemnity. Thus, for four consecutive years we continued to cheat our Christian mother and the Hindu neighbours with the Kottarakkara Railway Station water, and every holiday we had to give patient hearing to the numerous accounts of miraculous cures affected by the previous year's supply. Puthur Raman Nair had this to say: "During the last two years we had no need to seek medical help. My mother had a severe attack of diarrhea last April. I just gave her a spoonful of honey with two drops of the theertham in it. That was all. Within three hours she was perfectly cured". Kilannaparampil Lakshmi Amma said, "Every time my daughte,r got cold ot fever, a single drop of the theertham gave her perfect relief. I was wbject to severe migraine since I had a miscarriage three years ago. Now when I get any symptom of the head-ache coming on, I simply apply a drop of the theertham on my forehead and it stops with that. Even if it comes, the pain is only very slight." Vettuvelil Parukutty who had two difficult and complicated childbirths when she gave birth to her first two children, had a very easy one at home when her third child was born. All what she did at the third time was to take two drops of the theertham immediately when the labour pain started. Oliprakkatu Narayana Kuruppu proved the miraculous power of the theertham by an experimental research. He had two grafted mango trees in his garden. Both were of the same stock and of the same age. During the dry season he watered the two trees. Once he added a few drops of the theertham to the water he poured for one of the trees. When the flowering season arrived the tree which got a dose of the theertham flowered, while the other tree produced only a crop of tender leaves. Chankroth Patchu Pillai immunised all the members of his family by pouring a spoonful of the theertham into the family well. Since taking this precaution not a single member of the Chankroth family fell ill. There were numerous similar stories of miracles narrated by our neighbours who came to repeat their request for a further supply. The belief in miraculous powers of holy water is very ancient. Men in every walk and clime have maintained superstitious beliefs in the miraculous powers of sacred and holy objects, persons, places and times. Apart from the psychological effects of suggestion on their minds, there is absolutely no evidence to show that there are objective merits in such beliefs. Just as beneficial effects can be had by hypnotic suggestions, it is possible to have harmful effects, also by such suggestions or beliefs. Many of the neurotic subjects at mental hospitals are the final results of diverse types of superstitious beliefs. He who believes in sacredness is sure to get mentally tor­mented by acts of desecration too. Psychology tells us that such mental traumas are the causes of neurotic afflictions, mostly among the credulous and mentally feeble types. Among the numerous neurotics brought to me, I have found by statistics that the prevalence of neurosis among communities is directly proportional to the extent of superstitious beliefs held by them. Even in such communities, there are more women neurotics than men for the same reason. Better education for girls, and relaxation of the strict observance of the purdah, can help to a great extent to reduce neurosis among women. A present Deputy Director of Education was some years ago teaching at Jaffna Central College, where I too was a teacher. One day he drank some water from a 'kooja' kept in the staff room. A few hours later another teacher drained the last quantity of water from that kooja into a glass tumbler. Out came a small dead snake along with the water. The Director who heard about it became violently sick. The nausea was continuous, and we got alarmed. Finally, it stopped abruptly when he was convinced that the water he drank was from another kooja which was on the same table. Though the water he drank was from the same kooja. His nausea stopped when he was made to believe blindly that he drank from another. This shows how one can get sick and get cured psychologically. But to argue that sickness which is not psycho­somatic in origin can be cured by faith is absurd. The Kottarakkara Railway station water did not do any miracle in our neighbourhood. Our neighbours' anecdotes simply showed the credulous nature of those simple folks woo were brainwashed from childhood about the miraculous prop­erties of the theertham. Discarding logic and reason, their conditioned minds only attempted to give interpretations and explanations to suit their blind beliefs. The so-called beneficial effects of sacrifices, pilgrimages, offerings, prayers, bless­ings, worships, vows, consecrations, dedications, ordinations, Lourdes water, theerthams, prasadhams, sacraments, baptism, anointing, holy ash, yagna, pooja etc., are of superstitious beliefs. He who believes in sacredness is sure to get mentally tor­mented by acts of desecration too. Psychology tells us that such mental traumas are the causes of neurotic afflictions, mostly among the credulous and mentally feeble types. Among the numerous neurotics brought to me, I have found by statistics that the prevalence of neurosis among communities is directly proportional to the extent of superstitious beliefs held by them. Even in such communities, there are more women neurotics than men for the same reason. Better education for girls, and relaxation of the strict observance of the purdah, can help to a great extent to reduce neurosis among women. Academic education and intelligence need not be considered as marks of non-­gullibility. In fact, some of the highly educated persons in exalted positions are ex­tremely gullible, even resorting to witchcraft. It is only persons capable of rational thinking who can free themselves from credulity. Blind believers are mentally blind in spite of their intelligence and education. Recently much newspaper publicity was given to the alleged healing power of one D.C. Wijemanne, who calls himself 'Uthama Sadhu'. Numerous persons, includ­ing an ex-cabinet minister, are reported to have gone to this man to get their diseases cured by being blessed by this man. Like the Railway Station water, it was not the non-existing power of Wijemanne which affected the alleged cures, but the credulity of the minister and the others who went to him to get blessed made them imagine that they were cured. If the Minister was really convinced about the healing power of Wijemanne, as one who was responsible for the welfare of this country, it was his duty to have per­suaded his colleague the then Minister of Health to appoint 'Uthama Sadhu' to the General Hospital, so that the country as a whole could benefit. If 'Uthama Sadhu's claims are true, we can expect hundreds and thousands of incurable cases being brought to Ceylon from allover the world for miraculous cures. Indirectly this might even solve our problem of foreign assets!